BeachMint, a Los Angeles, CA-based social commerce company operating JewelMint, an exclusive jewelry of the month club, closed a $10m financing round. The investment is led by Trinity Ventures, with participation from Stanford University and existing investors, New Enterprise Associates and Anthem Ventures. The company intends to use the funds to bolster the staff and launch new verticals and celebrity partnerships in 2011, which BeachMint will announce in the first quarter of 2011. 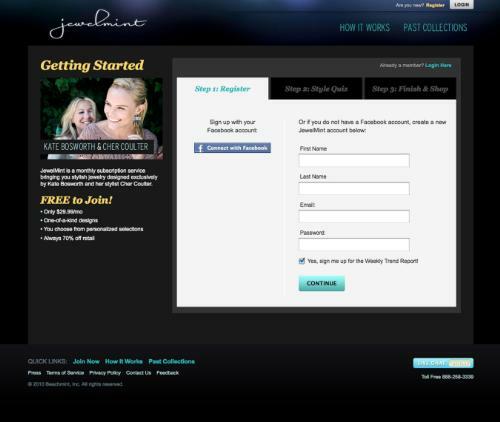 Founders Josh Berman (MySpace Co-Founder) and Diego Berdakin (serial tech entrepreneur) launched their first ecommerce site – JewelMint – along with style icon, Kate Bosworth, and her celebrity stylist, Cher Coulter. JewelMint features monthly collections designed by Kate Bosworth and Cher Coulter. In conjunction with the deal, Patricia Nakache, General Partner at Trinity Ventures, will join the company’s board.